Villa Anggrek is a great Seminyak villa located in the heart of the action, with three equally sized bedrooms and endless tropical appeal. 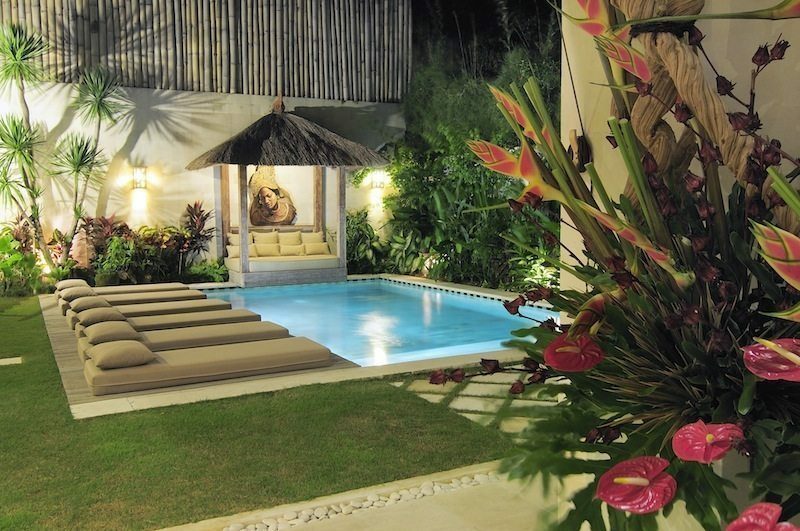 Villa Anggrek is a great value villa in sought-after Seminyak. The villa is styled with luscious tropical touches and authentic Balinese appeal, with the open-plan living areas directly overlooking the villa’s sparkling private pool. Located within a hop and a skip from the main street of Jalan Raya Seminyak, Villa Anggrek offers enviable access to some of the best restaurants and shops in Bali. 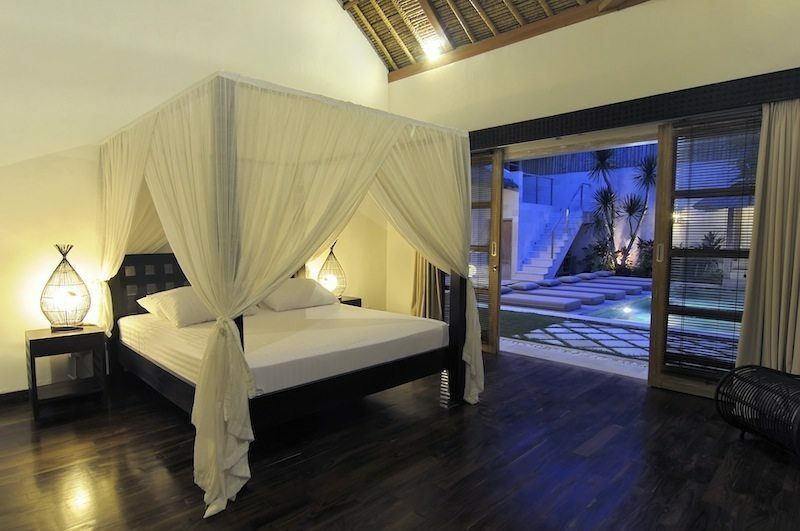 Villa Anggrek has three equally sized bedrooms, so there’s no need to fight over top billing here. Villa Anggrek is decorated with timeless tropical style that feels right at home in Bali. The summertime feel is played up by the beautiful swimming pool. 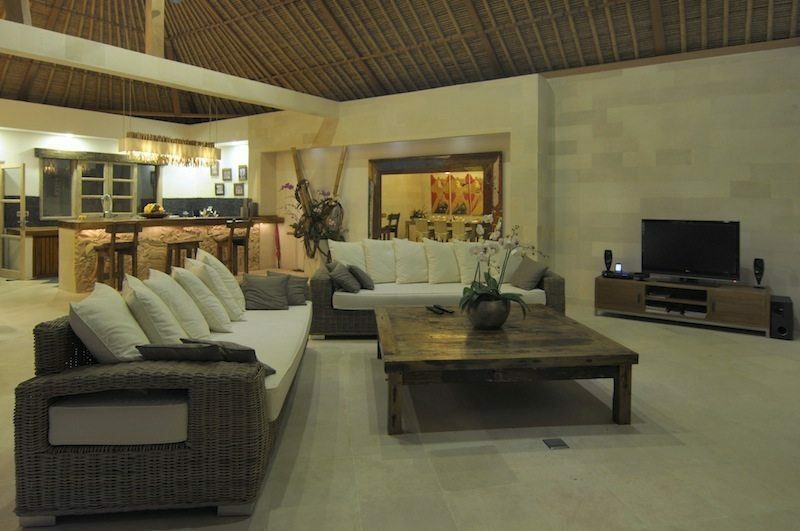 Villa Anggrek has a spacious open-sided living room which overlooks the pool and garden. The living room is furnished with soft rattan sofas and a flatscreen TV and crowned by a soaring alang-alang ceiling. 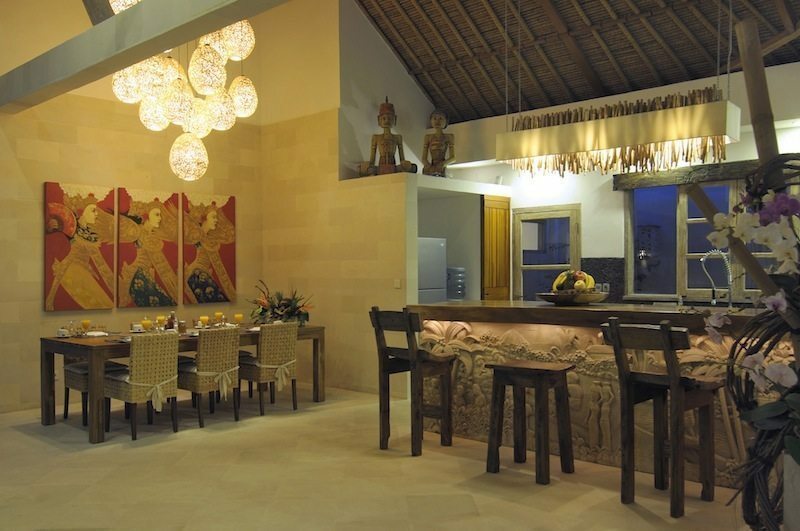 Villa Anggrek’s eight seater dining table is housed in the spacious open-plan living room. 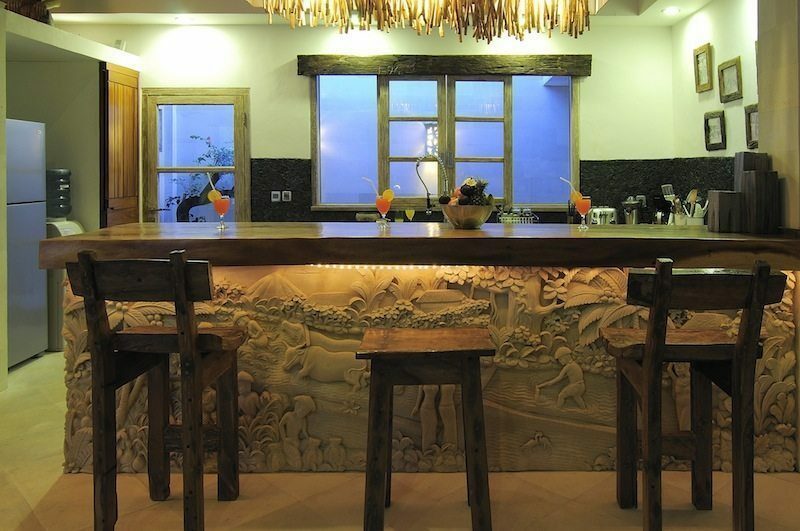 A few steps away is the villa’s fully equipped kitchen. 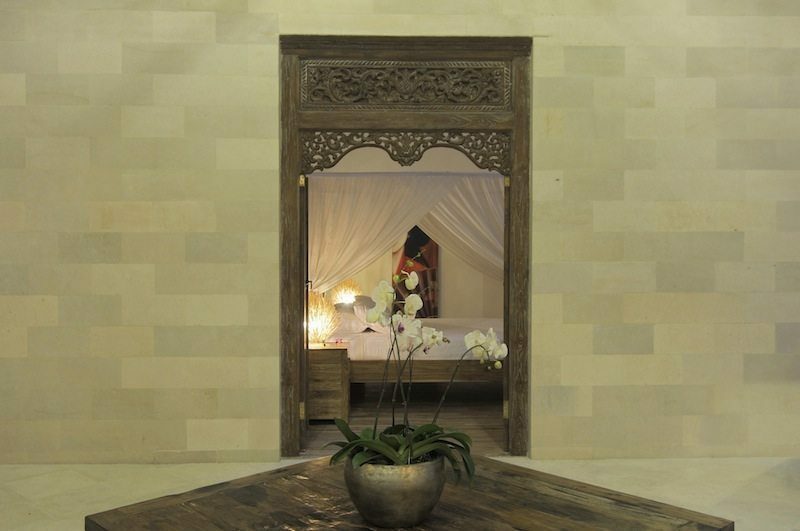 Villa Anggrek has a private massage room located upstairs on the first floor. 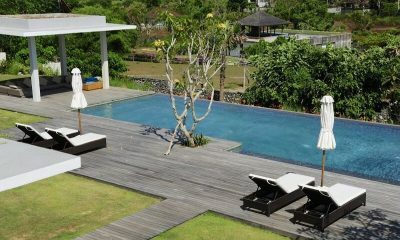 Villa Anggrek’s outdoor spaces are dominated by a beautiful swimming pool measuring at 8 x 4 metres. The pool is lined with white sun loungers and a romantic bale gazebo. High walls surrounding the villa ensure privacy. 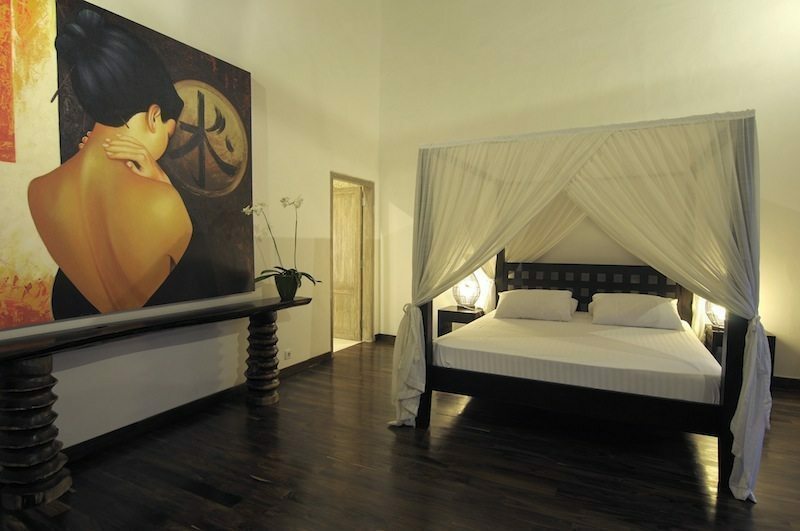 Villa Anggrek has three bedrooms, all furnished with a king-sized bed. All three bedrooms are located by the pool. The first master bedroom houses a king-sized bed and is adjoined by an ensuite bathroom with a bathtub and a shower. The second master bedroom also has a king-sized bed and an ensuite bathroom with a bathtub and a shower. The guest bedroom has a king-sized bed and an ensuite bathroom with a shower. 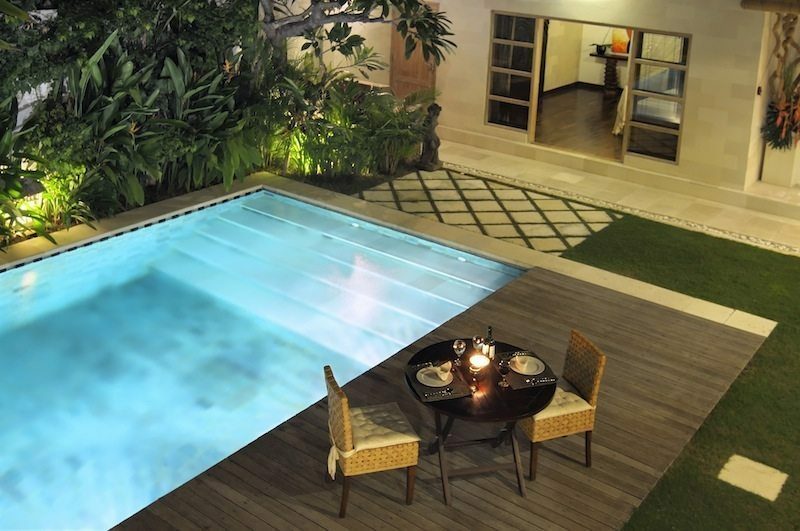 Villa Anggrek is a three-bedroom villa that’s built around a private 8 x 4 metre swimming pool. 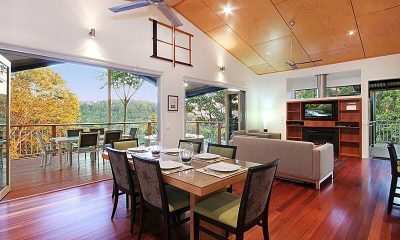 The villa features an open-sided living and dining room flanked by three air-conditioned bedrooms. Your stay in Villa Anggrek is made enjoyable by the professional staff. Villa Anggrek’s staff have been professionally trained and will do their utmost to please with their warm and friendly Balinese hospitality. Villa’s experienced and knowledgeable manager is responsible for the overall operation of the villa. The villa manager will oversee and coordinate the staff and property and assist you during your stay. 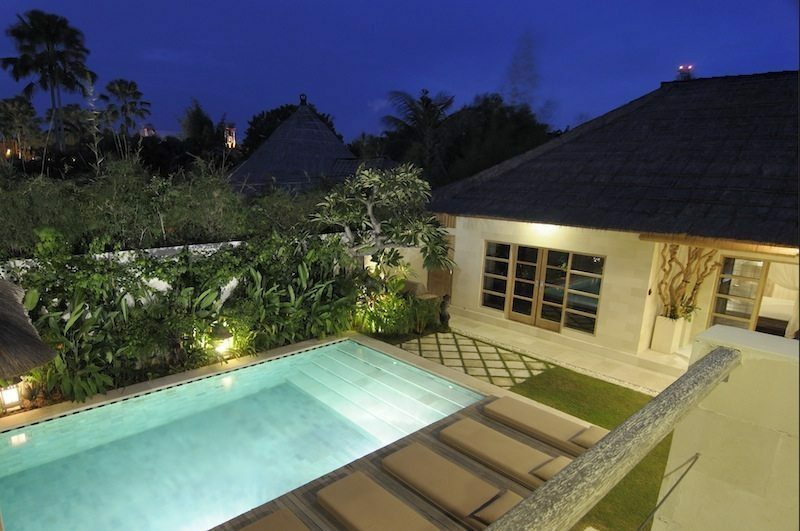 Villa Anggrek is centrally located in the sought-after Seminyak neighbourhood in Bali, Indonesia. The villa is tucked in a smaller sine lane between Jalan Raya Seminyak (a major shopping and dining strip) and Jalan Sunset Road (the main road connecting Seminyak to the rest of the island). There are plenty of great restaurants and trendy boutiques within an easy walk from the villa. Bintang Supermarket is also close by. Villa Anggrek is located about 30 minutes from the airport. My friends and I loved everything about the villa. Nyoman and Ketut kept it looking clean and tidy at all times. They were also kind enough to prepare fruit for us on the days we did not request breakfast. I would highly recommend Villa Anggrek to everyone. I just wanted to drop you a quick email to let you know that we had a fabulous week at Villa Anggrek. Everything about the villa met our expectations, the bedrooms, kitchen and living area and particularly the gorgeous pool and garden. The staff (Nyoman and Ketut) were extraordinary and they went out of their way to ensure that all our requirements were met and the villa was spotlessly clean. There are a couple of things in particular that Nyoman did for us while we were there that I would like to share. I had scheduled at a cooking school in Ubud (Paon Cooking School – can highly recommend!!) and got my days mixed up. I telephoned Nyoman to advise that I had mixed up my days and that she wouldn’t be required to cook breakfast as we would be leaving the villa very early. When we woke at up 6.30am, Nyoman was already in the kitchen preparing breakfast which was a lovely surprise. Also, on our last day my husband developed an ear infection and Nyoman kindly took him to the doctor. Nyoman organized the hiring of scooters, an in-house massage every day and both Nyoman and Ketut cooked us a lovely Balinese dinner one evening in the villa. 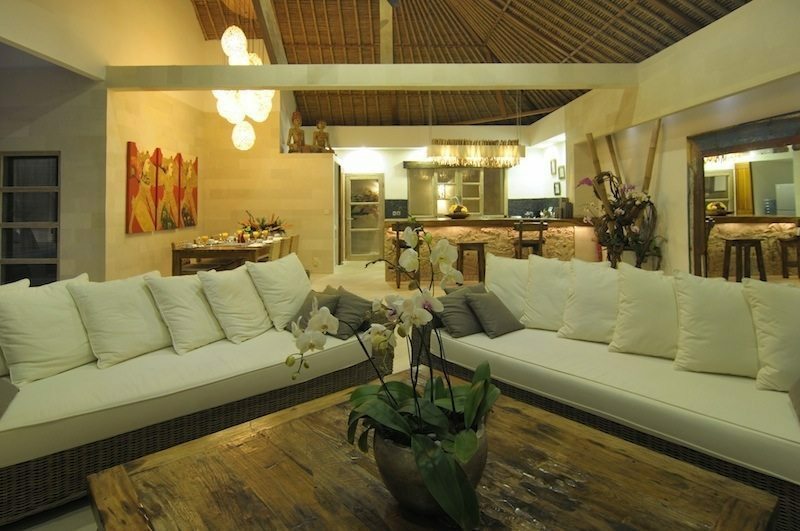 Our friends had not been to Bali before and had never had a villa experience. They both loved Villa Anggrek and Bali. Thank you Sara for assisting with choosing Villa Anggrek, it ended up being the perfect choice for us. Thank you so much for the feedback. 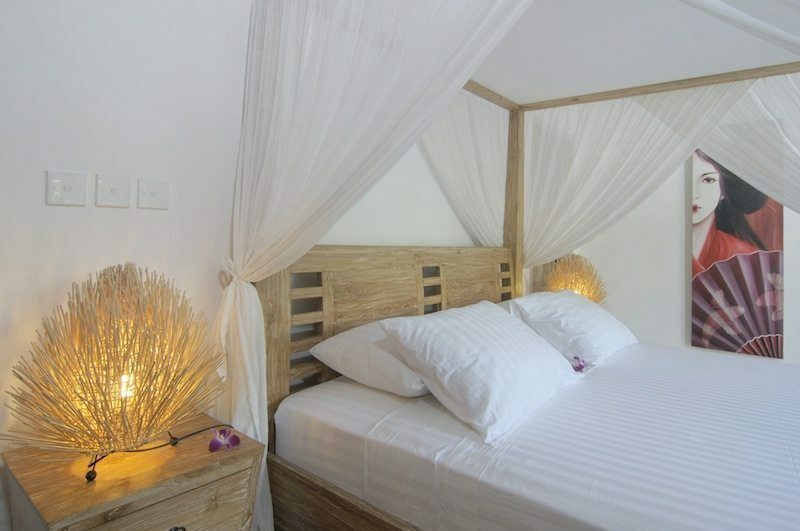 It’s wonderful to welcome you back to this fantastic Seminyak villa. Do stay in touch with the Ministry of Villas team and make sure to contact us next time you are planning to come back to Bali. 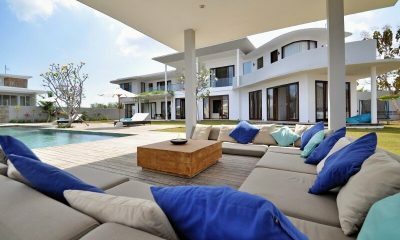 WOW, Villa Anggrek exceeded our expectations and was even more beautiful in reality than the photos here depict. It is very spacious and we spent a wonderful 5 nights here, would have stayed for more, but due to its popularity it was already booked, so we had to move on to another Villa, which after this one was disappointing. We are a family with 2 young daughters, aged 6 & 10. We opted for the more affordable 2 bedroom option with the girls sharing a bed. It was lovely to be given the option on arrival of which 2 bedrooms we wanted. The staff were so welcoming and cooked the most delicious breakfast to order each morning – our 6 year old is a particularly fussy eater, but devoured everything! Yanti the Manager met us on arrival and gave us a tour of the Villa, a very nice personal touch. When we required a babysitter, I simply sent Yanti a text and she got straight back to me and arranged for one of the staff to babysit for us that night – all arranged very quickly and smoothly. We absolutely loved the layout, design, comfortable beds, stunning bathrooms, glistening pool, relaxing day bed & sun loungers and beautiful gardens at this Villa. The outdoor bathroom was a real treat. The small area of grass by the pool was great for the kids. We used the massage room, by arranging for an in-villa experience from a nearby spa, great massage – however, would not recommend their hair braiding service … very slow, don’t think that is their forte! The Villa’s location is great, nice restaurants within walking distance and plenty of shops, because of the girls, we did opt for taxis to transport us to the more popular ‘Eat Street’ in Seminyak, but they were readily available and so cheap at a few $’s each way. Without children, this would be a doable distance to walk. The Bali Deli, less than 2 mins walk from the Villa is a great gourmet supermarket to get your supplies from. 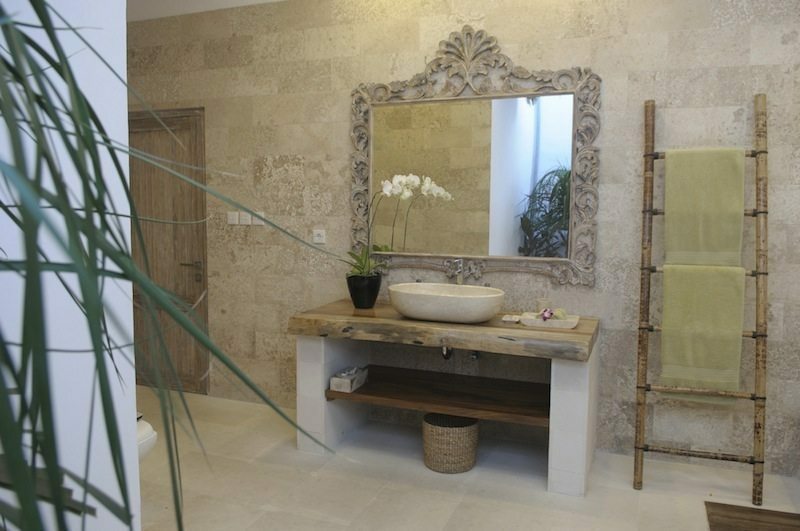 All in all, an absolutely stunning villa that we would have no hesitation in recommending. On posting the above review I forgot to mention the service we received from Sara at the Ministry of Villas was outstanding. She responded to my initial email asking for assistance with finding a villa within a matter of hours. All other emails were replied to quickly. The whole booking process is very simple. Sara provided us with a lot of additional information regarding general information on Bali, tours and many restaurant recommendations – her personal favourites. Ministry of Villas definitely know the meaning of excellent customer service! 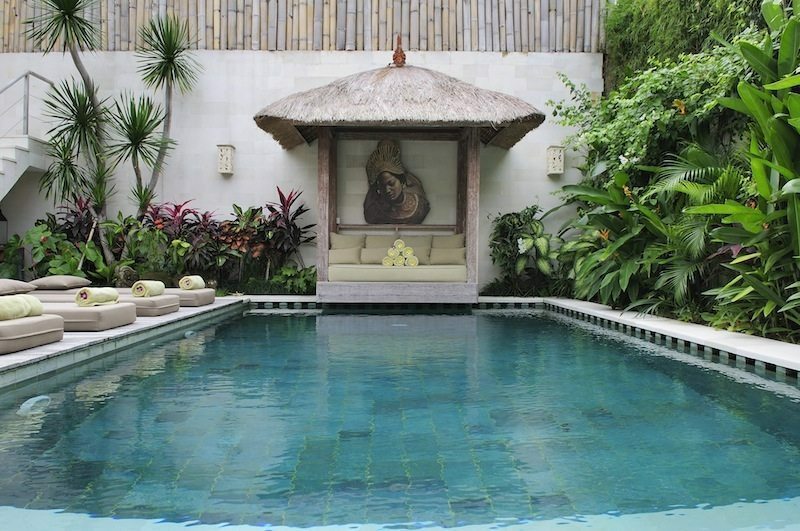 Villa Anggrek is a spacious villa, beautifully decorated with a lovely garden and pool. When we arrived the villa Manager , Yanti and the three lovely ladies who took care of us during our stay were there to greet us. They asked what time we would like breakfast served and whether we would like a cooked, Indonesian or continental breakfast. They arrived each morning at 8.00 to cook breakfast and then clean the villa. A gardener and pool man also visited during the week. The ladies clean the villa to a very high standard and the breakfast is very good. 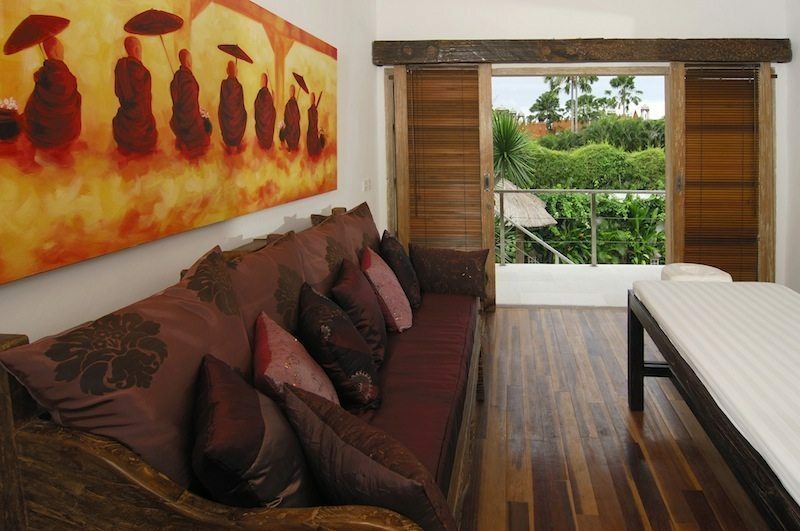 Villa Anggrek is down a laneway off the main road in a quiet part of Seminyak. There are many shops and restaurants of different cuisines close-by. The Bali Deli is 5 minutes walk away where you can buy groceries if you want to cook in the villa. You can also have lunch or dinner and they have a reliable money changer there. We only ate at one restaurant close to the villa, the rest of the time we took cabs to Petitenget or the busier, more popular part of Seminyak, which cost $5 AUD each way and took about 15 mins through chaotic traffic. Make sure you allow enough time if you have dinner reservations! We had a peaceful, relaxing week at Villa Anggrek, which was exactly what we wanted and would recommend it if you want to be away from the hustle and bustle. What an amazing, beautiful place to stay. The villa itself is heaven, the rooms are airconditioned and bathrooms are very spacious,and the decor is beautiful.It is perfect location and so close to all amenities,restaurants and shops,cafes one being the bali deli which is so perfect.The staff were absolutely fantastic,if there were any problems with anything it was attended to immediately. Just a quick note from home in Australia to say thank you once again for providing us with such a wonderful home away from home in Bali. I have been lucky enough to visit Bali many, many times and I must say that your beautiful Villa and incredible staff made this trip very much one to remember. You are very professional and accommodating. Stayed for 4 wonderful nights. Only 2 of us but they allow us to book just one bedroom in this 3 bedroom villa. It’s been a perfect place and beautiful moments together for both of us. Cosy settings…easy location. We are regular Bali ( Seminyak) holiday visitors. After spending the last 9 nights at Villa anggrek, it would be difficult to stay anywhere else. The villa decor was exquisite, the location is perfect and Nyomen, Ketuk and Made were our amazing staff that made our holiday just perfect. We stayed as a family ( grown up kids ) and celebrated my husbands’ 50 th birthday in the villa. Our friends and family that were staying elsewhere were blown away by Villa anggrek and by the hospitality of the staff. The villa owner was terrific and extremely easy to deal with. We can’t wait to get back there! This villa is awesome. I love how they designed the interior. All of the decorations are antique and unique to every room so it’s like walking into an art gallery and there is no closing time so you can stare at them as long as you want. The staff are so nice and helpful. The location is perfect as it’s close to shops and cafes yet not noisy even though it’s close to the road. The owner is also very communicative and helpful. I have nothing to complain about this villa. Will definitely stay there again next time I go to Bali! 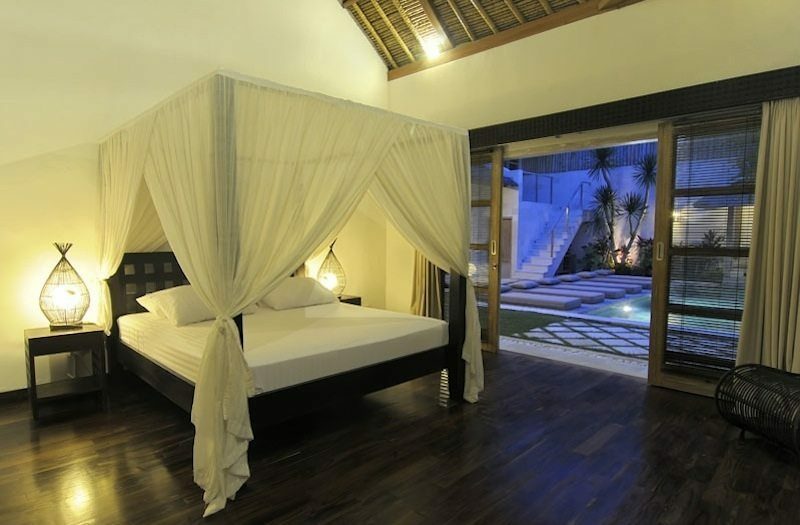 We spent nine nights at the villa and it is in a great position for expolring Bali. 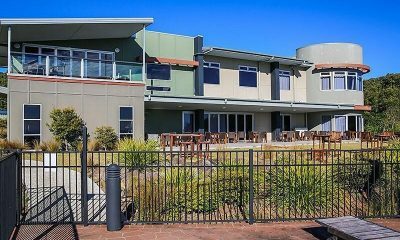 Far enough away from the rat race, but within easy walking distance to major restaurants. The staff are fantastic and very professional. Daily breakfast was cooked to order, whatever your choice. Bali deli ony a few steps down the street, for all your daily shopping. Facilities in the villa were excellent and met all our needs, just like home away from home. This villa was amazing, the hospitality from ayo and her team was amazing, breakfast cooked every morning, fresh fruit followed by a full cooked breakfast. They were on hand for our every question and need, AYo went the extra mile for us and made us feel like royalty. I have never felt like that in any hotel I have stayed in. Ever! The villa itself was a little slice of heaven, the bedrooms, bathrooms and walk in wardrobes were huge and luxurious, the beds were comfortable and again huge. The living area was a perfect space for my friends and I to chill in and the pool was perfect for our group to dip in on the very hot days. I would recommend getting a full body massage it cost about 10GBP with is so cheap, especially in the comfort of your own villa. Pick up and drop off to the airport we really couldn’t ask for more. maybe just hat we had been there for longer. Was not sure even about visiting Bali or the accommodation as i always prefer a high level of comfort!! 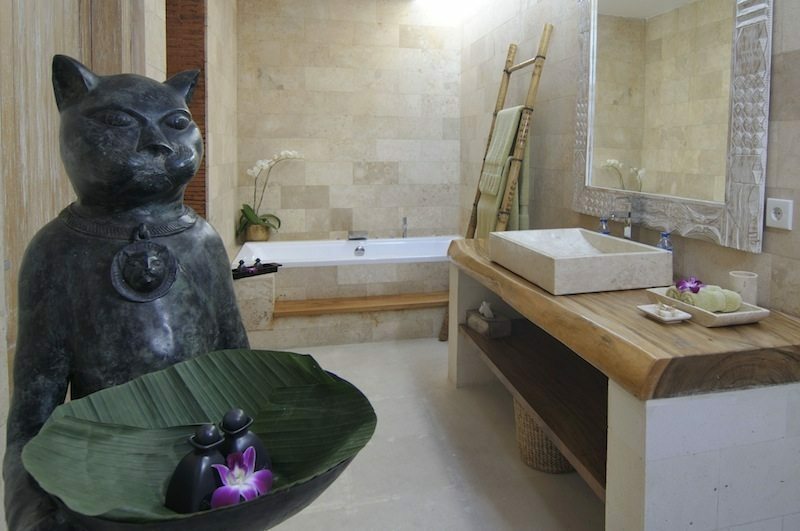 I was absolutely won over by the facilities at Villa anggrek such as the beautiful bathrooms,very comfortable beds,lovely air conditione bedrooms , lots of space for your clothes I could go on and on! !The whole set up with the beautiful courtyard,lovely swimming pool which I used daily, the ease of shops for dining ( just down the road – 1-2 minutes) japanese food/ mexican food/Bali Deli/Chinese food/Italian food and the massage literally across the road – Lydjia and Nanda wonderful and friendly!! From the moment we arrived at Villa anggrek we were in heaven! We were greeted by the beautiful staff with warm and friendly smiles. The staff were so efficient and nothing was too much trouble. We loved the layout of the Villa, created around the beautiful pool, surrounded by lush gardens. The interior was simple and stylish. Each room was a little different but worked in unity with all of the others. Villa anggrek is in a great location. Not too far from the heart of Seminyak and close to Legian. Bali Deli is close by too. Plenty of restaurants around and great boutique shopping just a stones throw away. Our stay was absolutely perfect at Villa anggrek, I cannot fault it except it was not long enough! I stayed at Villa anggrek with my partner and 4 other friends. The location is perfect, the staff are beautiful and the surroundings are heaven! I highly recommend this villa to anyone looking for accommodation in a great location with lovely service and wanting to be surrounded by modern Balinese style. We will definitely be back!